1 : 975000 Johnson, A.J. 1 : 1190000 Tanner, Henry S.
1 : 960000 Colton, G.W. 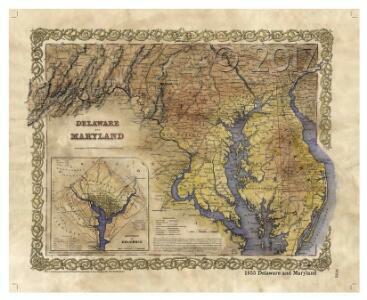 New railroad map of the states of Maryland, Delaware, & District of Columbia. 1 : 874643 Hammond, C.S. Maryland, Washington D.C., and Delaware. Martenet's Map of Maryland, Atlas Edition. 1 : 950400 Martenet, Simon J. 1 : 1100000 Lucas, Fielding Jr.
1 : 850000 Buchon, J. A. C.; Carey, H. C.; Lea, I.